MIAMI -- There probably were few, if any, fans at the Home Run Derby taller than Joel Embiid. And the Philadelphia 76ers big man got himself a rebound, sort of. 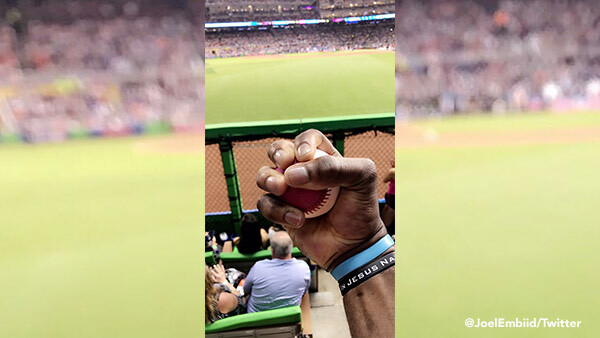 Embiid posted a photo on Twitter of his hand wrapped around a baseball during the Derby at Marlins Park on Monday night, in relative proximity to one of the outfield fences. "And I got a ball," Embiid wrote. Minutes later, he sent another photo, proving the first time was no fluke. It was a diverse sports day for Embiid, who was tweeting about Wimbledon earlier Monday. Aaron Judge of the New York Yankees won the Home Run Derby, adding that title to his burgeoning list of rookie accomplishments. Judge beat Miguel Sano of the Minnesota Twins 11-10 in the final at Marlins Park on Monday night. He becomes the fourth Yankees player to win the Derby after Tino Martinez in 1997, Jason Giambi in 2002 and Robinson Cano in 2011. "Aaron Judge is a beast," Embiid tweeted.